Here is another card I made for this week's CAS challenge on Splitcoast. Visit this post for more info on the challenge and a link with more challenge ideas from the new CAS design team. 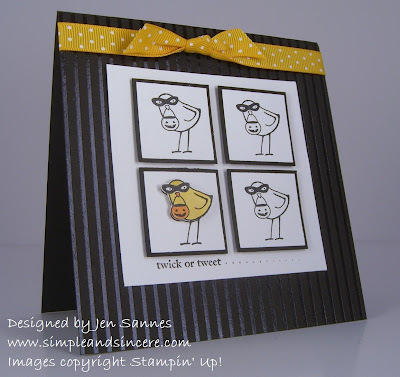 For this card, I popped up the punched squares and I colored and cut out an extra lil' chickadee and popped it up. I love this card - it just make me happy! 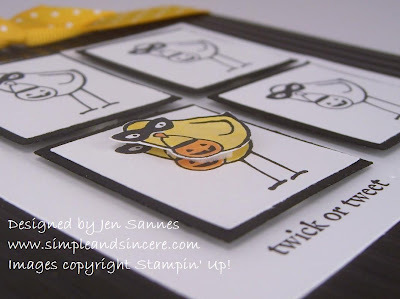 Adorable card, Jen!! Love it!!! I've been thinking of getting this little Halloween set and then I saw your card & I knew I HAD to have it! So Darn Cute! So cute! I must get this set, too!